Home Canada Some Media Slam Trudeau Libs; Some Spew Garbage. — Andrew Coyne, National Post, April 3, 2019. “Only a leader surrounded by sycophants could have imagined that the past seven weeks of denial, deflection and smears could succeed in rescuing his reputation. Nice wordcraft, and moreover, it has a rarely-found-in-North-American-media truthiness to it. 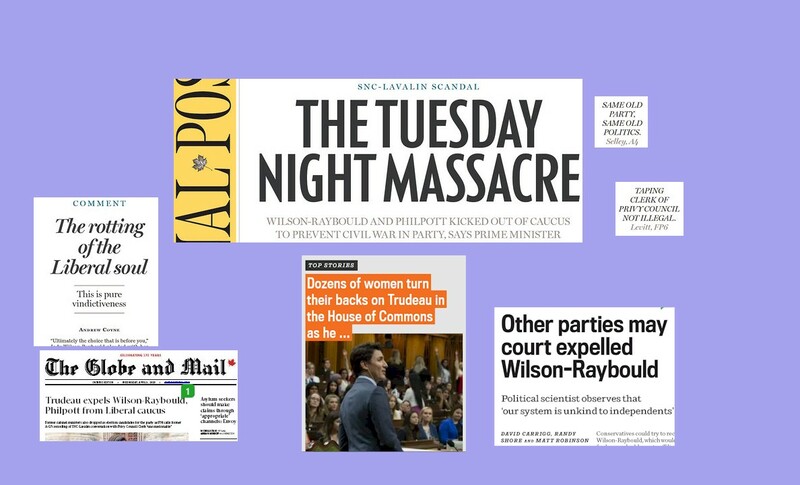 …there’s this nonsense — pure idiocy, really — in the Globe & Mail from some political consultant named Andrew MacDougall: Trudeau channels Trump as he ejects Wilson-Raybould and Philpott from caucus. MacDougall strains and digs and reaches so hard that apparently his arm popped right off and then his head exploded as he tries to make the case — and he fails miserably — that Trudeau is acting like Trump, somehow, in this SNC-Lavalin scandal. You know, because Trudeau fired people, just like Trump fired people. See, “you’re fired,” means, if I understand correctly, that me and most every other person on earth who has fired somebody is “channeling Trump” too. Total garbage. Expelled by the Liberals, Wilson-Raybould could be courted by other parties. It’s not so much that Jody Wilson-Raybould would never, ever go to the Conservatives on account of the fact that she’s the most liberal woman in Canada, a principled one at that, and more liberal than any Liberal; it’s the frustrating fact — yes fact — that the Conservatives could actually go ahead and court her — an obvious liberal — making complete asses of themselves and their supposed principles again (see their support of supply management, etc., for more on that). She’s a liberals’ liberal. She literally spits red. And yet the Conservatives could conceivably be seen to court her. The Conservatives are just that dumb sometimes. So maybe it’s not a total garbage article. But then, as if to turn this near-garbage article into a real committee effort, lefty-style, the article is by-lined by a team of no less than three journalists, David Carrigg, Randy Shore & Matt Robinson; but even at that they didn’t have enough material on their own to conjure-up this nonsense, so also “with files from Mike Smyth.” Go team. I think there’s enough material provided by the Liberals for each of the four of you to write-up one each.